"Developing Americas Youth Through Athletics & Education"
Snap, Hold & Kick was established in year 2000 with the idea of providing camps for kickers, punters and snappers. Our Mission: "Developing America's Youth Though Athletics and Education" ​was also established and in which is a big part of who we are. Our objective is to provide a relaxed environment, positive and impacting relationships to our participants. Speakers from all walks of life (school counselors/attorneys, probation officers, college/pro athletes etc.) are also invited to discuss life, character building and academic skills needed to influence the participants to be good citizens and student-athletes. It has experienced growth every year with the latest to date camps averaging over 200 participants and over 20 volunteer staff. None the staff and volunteers are paid with 100% of the proceeds, fundraising and grant money going back into the program (ie: overhead costs, insurance, equipment and scholarships). Snap Hold& Kick is a non-profit IRS 501 (C) 3 Federal recognized program. All cost and donations go towards the benefit of area football players and specifically earmarked for training development, education and recruitment. 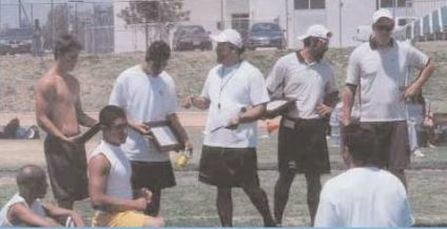 Over the past seventeen (17) years SHK has taken the lead in developing high school and college football student-athletes in Southern California. SHK also collaborates with many youth programs throughout the nation to promote not only the kicking game, but other football position specialties. SHK promotes life skills development and the importance of higher education beyond the high school level. Many of our student-athlete participants have moved on to pursue football opportunities at local Junior colleges as well as to some of the most prestigious colleges and universities in the country. These services have been offered at no cost throughout the years to all participants. However SHK is looking to expand in order to serve a greater number of youth along with providing the necessary tools to operate at the highest level and intensity. During years 2-7, SHK was established and recognized as a Federal 501 (c) (3) non-profit entity. During this same period, the program blossomed from averaging 15 attendees the 1st year to average almost 100 participants from all over the Inland Empire that included high school and college kickers, punters and snappers. Kaiser HS became a wonderful partner by offering facility usage and a great football setting and football stadium. In 2012 the SHK Los Angeles Chapter began at South Region High School and has since then been growing as well. SHK participants have earn all-league, all-CIF and all-state honors and our 1st college all-American and Lou Groza winner in 2005 which is the highest award given to a college kicker. In our first year, we held our first camp at Colton HS and averaged 15 specialist that year over the course of 12 camp sessions. Looking back, with no funding, it was amazing how we were able to make it work with 12 used footballs, man made holders, field markers and just of a group of former college and pro staff that was committed to pass on the knowledge of the kicking game with passion. Well, year 2000 was only the beginning!